These Victorian vents are made in the USA by Classic Grilles by way of a sand cast. Each decorative air return covers are 1/4" thick solid white bronze and are handmade, making each unique cover to the owner. This Victorian vent is durable enough to be used on your floor, wall, or in your ceiling. If ordering for floor use please note use in customer comments section. Installation of the decorative air return covers, is easy because of the pre-drilled screw holes and included screws. All of the Victorian vents come with a metal screen backing, which is painted black, to help hide the sight of your duct opening. The decorative air return covers faceplate is finished with a clear coating to help protect the white bronze coloring. Please note that the finish is similar to a brushed nickel. When ordering your Victorian vent, order all of them together to receive one low shipping cost! Our decorative air return covers by Classic Grilles are one of a kind vents made special ordered just for you. Tip: Order the Victorian vent according to your hole opening in the wall or floor. 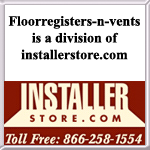 Do not measure any old vent covers. The 12 x 10 decorative air return covers will fit over a hole measuring that same size. The exact faceplate size may differ from vent to vent because they are sand cast. Approximately 2 inches will be added to the listed sizes shown above for the faceplate. Important: These Victorian Vents are made to order and are considered a special item which is non-returnable and cannot be canceled once an order has been placed. Because the decorative air return covers are made by hand, they can take between 7 to 9 weeks to ship once payment has been received. Find this Victorian vent on our website available for purchase with an adjustable damper if you wish to close off air flow. 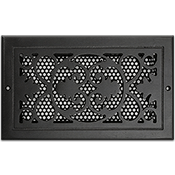 Also, other decorative air return covers designs by Classic Grilles is shown for every style. Take this Victorian vent and update your old home with fresh covers to hide your air supply ductwork. Call today to order.